Mushrooms are a common features of most North American lawns and will even grow in areas treated with herbicides and pesticides. Many people regard these fungi as a nuisance; however, they're an important part of the natural cycle of decay and can help make the soil richer and more fertile. Some lawn mushrooms are even edible, but many types are poisonous and can be a hazard for dogs and small children. Being able to identify common yard mushrooms can help homeowners decide whether a fungus can stay or needs immediate removal. Amanita phalloides (also known as the death cap), Amanita virosa (also called the destroying angel) and similar species are white to tan mushrooms that bear a strong resemblance to the common button mushroom, field mushroom and horse mushroom. These fungi are poisonous and can cause severe illness or even death. According to American Mushrooms, they can be identified by the membranous veil of tissue around the base or partially connected to the cap of the mushroom, though a spore print is the most effective identification method. Agaricus mushrooms are closely related to the common button mushroom found in stores. According to Mushroom Collecting, many agaricus species are both edible and delicious. However, these large white mushrooms bear a close resemblance to poisonous species and should be approached with extreme care. Species include Agaricus arvensis (the horse mushroom), Agaricus campestrus (the field or meadow mushroom) and Agaricus bitorquis (the sidewalk mushroom). When young, these mushrooms sometimes have a veil similar to that of amanita species or may be mistaken for small puffballs. Another type of large white toadstool, Chlorophyllum molybdites and similar species are common “fairy ring” mushrooms that grow in lawns during the spring and fall. These mushrooms are poisonous, producing abdominal pain and gastro-intestinal symptoms. They closely resemble some edible species, such as Lepiota molybdites. However, chlorophyllum mushrooms produce green spores and may have greenish gills. Coprinus mushrooms, also called Shaggy Mane mushrooms or Ink Caps, are tall, shaggy specimens with gills that turn to a gooey black liquid with age. 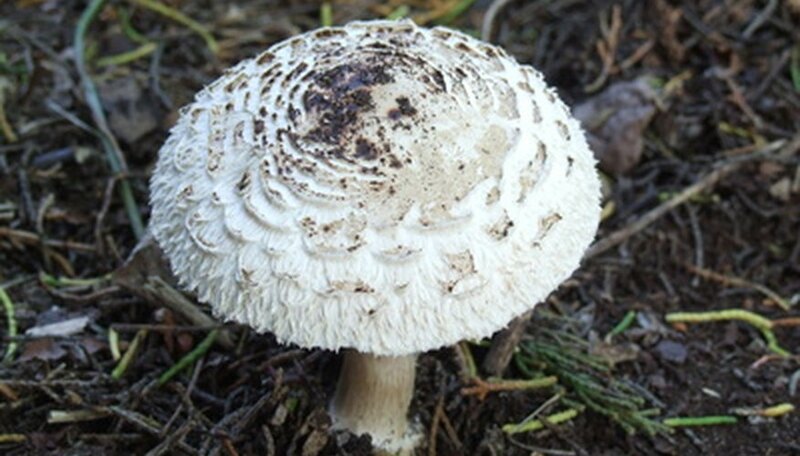 They grow readily in lawns, forming lines, clusters and rings and have a shaggy white surface and brownish top. The flesh is white and soft. Despite their unattractive appearance, these mushrooms are edible and have a delicate flavor but must be cooked quickly before the gills liquefy.